When I met Oliver Perry, I had no clue he was the lead singer for The Heartbreakers. And he had no idea that I was the only girl in the world who hated his music. But how can Stella even think about being with Oliver–dating and laughing and pulling pranks with the band–when her sister could be dying of cancer? The Heartbreakers was a cute, fun, and quirky read—the perfect summer read! The story begins with Stella and Drew (2/3rd’s of a set of triplets) deciding to go get Cara, their sister who has cancer, signed CDs from her favorite band for their birthday. However, Stella hates the band and let’s them know exactly how much when they’re stuck in an elevator ride together after getting turned away at the signing. After Drew takes Stella to apologize, they get sucked into a fun night hanging out with The Heartbreakers. Everyone has a blast, and Stella is offered a job by their publicist after he sees the photos she took of them. Now, Stella is off touring with the band—something she would never believe possible. Two main themes in the story were of family and friendship. I especially loved the relationship between the three siblings. Stella, Drew, and Cara were always there for each other, whether that was hanging out in the hospital with Cara every day or pushing Stella to take her dream job and focus on a photography career. Stella’s relationship with The Heartbreakers was just so much fun. All the pranks and antics they get up to just make it a really enjoyable read. And, yes, Stella starts a romantic relationship with one of the bandmates, Oliver. Their relationship was definitely a roller coaster ride filled with lots of bumps, but it was still very cute and I was rooting for them to get together in the end. Overall, this is a cute, fun, and fluffy read. There are definitely some unrealistic parts, but without them, the story wouldn’t be as enjoyable. 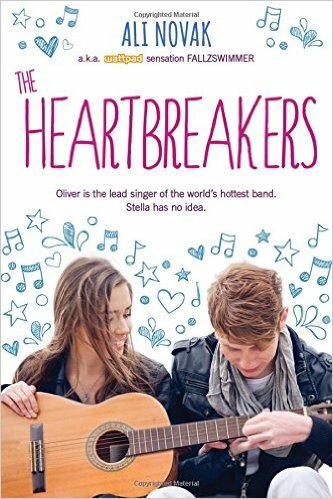 If you’re looking for a light, cute contemporary read featuring a band, The Heartbreakers may just be for you.